Ask fellow campers about "Fort Massac State Park" and nearby attractions. We really loved this state park. We were concerned about fitting our 5th wheel (41 ft) into the sites, but had zero issues. The park is super clean and right on the Ohio River. There is a lot of shade. Each site has a fire pit and a picnic table. We were in site 16 (50AMP). There are some low branches, but nothing that impeded us. 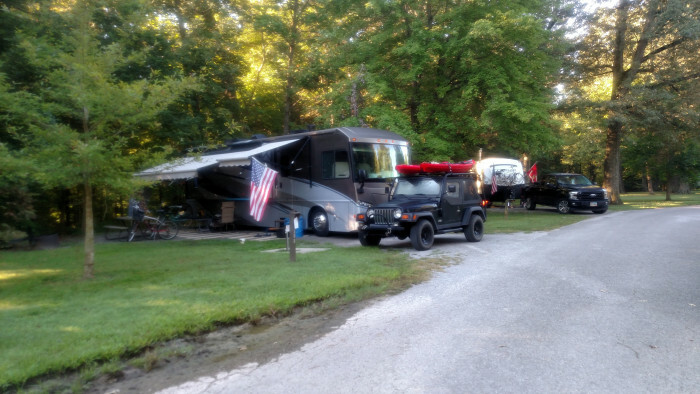 We camped at Fort Massac State Park in a Fifth Wheel. The superman statue in town is fun to see. There is a museum and some photo ops. This is another beautiful Illinois state park. We got in past dark and had to leave early the next day so didn't get to explore but wouldn't hesitate to stop there again. No water or sewer at sites so we used the bath house. The water in the ladies' side never got past lukewarm, and you had to keep hitting the water button to keep it running. If you're used to taking a Navy shower, that's ok, I guess. But that's my only complaint. We would like to visit again when we have more time. We camped at Fort Massac State Park in a Motorhome. Just outside the park, within walking distance, there is a Sonic, if you're craving fast food. Stayed at Fort Massac SP on our way to Nashville from St. Louis. We arrived well after dark around 11PM on a Friday. Missed the turn into the campground because the sign was far off to the left outside of your headlight view in the dark. The site #'s themselves are also very hard to see, and also because the reservation card put up by the host completely covers the # on the post! My co-pilot had to get out with a flashlight and direct me to the site. Once there, it was plenty nice. Level site, clean, quiet. The next morning the host checked in on us to make sure we were who we said we are, and he was very helpful with info about coming back the following Monday for the eclipse. We bugged out early on Sat so never got to explore the park at all, but it seems really neat and we hope to go back soon and experience it all. We camped at Fort Massac State Park in a Motorhome. Going into town to see the Superman statue is mandatory. Have been coming here for over 20 years and it is a nice park but if the state would spend some money to put in a new bathroom or at least update the one that has not changed for all the years we have been coming here it would get a higher rating. At least this time the lock on the men's restroom was fixed. We camped at Fort Massac State Park in a Motorhome. Fort Massac was Illinois' first state park (1908). Located on the Ohio River, less than a mile from downtown Metropolis, it's a lovely setting of mature trees and rolling grass. The campground has two loops for RVs and a dedicated tent camping area. RV sites are very spacious, with level gravel pads and shade throughout. The fort and visitor center is a short walk from the campground. We didn't see a check-in station but our site was already marked with our reservation card, and a campground host is on the property. We used Fort Massac as an overnight stop to tour Paducah, and had a lovely afternoon walking around the park and nearby Metropolis. We'll mark this campground as a favorite! We camped at Fort Massac State Park in a Motorhome. I stayed here for three nights. It is a handy campground off the Ohio River in Metropolis, Illinois. They only have 50 and 30 amp electrical service. Water is obtained at several water faucets sprinkled in the campground. The sites are large and each has a table and fire ring. There's a playground for kids. No campsite sewers but they do have a dump station. We camped at Fort Massac State Park in a Motorhome. Super Museum, Superman statue and Noel Neill statue. Very enjoyable stay. Came for the Superman Celebration in Metropolis. Be aware that if you have a 50 amp unit, you need to request a 50 amp site. There were 2-30 amp sites that had been tampered with. Don't screw it up for someone else. Can create an electrical hazard. Campground host is very nice. Water not available at sites. Fill up before parking your rig, unless you have a long hose. Restrooms/showers have been updated in the last few years. Sites are fairly level. We'll definitely return when in the area. We camped at Fort Massac State Park in a Motorhome. Big John grocery within 1 mile; Superman Celebration (mid June); Superman museum and statue; casino; Fort Massac in park. Paducah, KY is about 7 miles South. Only stayed here one night en route. It was very spacious. Saw a lot of deer. Camp host was friendly. It was a pretty park. Would stay here again. 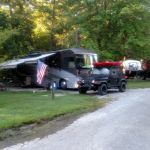 We camped at Fort Massac State Park in a Fifth Wheel. Regular rate is $20/nite, holidays are $30/nite for 50 amp electric only at the site. If you make a reservation through the website for a holiday, they will require a 3 night stay but you can just drive in and have a shorter stay. It was not full for the July 4th weekend. The campground is basically 2 large grassy, paved, loops with plenty of space between each site. The sites are large and gravel. There are lots of big well-trimmed trees so your line of sight extends throughout the campground. It was beautiful and quiet here. Bathrooms were cleaned daily, but in need of an upgrade. Camp hosts were helpful and pleasant. There was substantial flooding in the park from the Ohio River, but it did not affect the campground or the roadways in/out. The Fort is closed due to the 2011 flooding issue. We loved it here. We camped at Fort Massac State Park in a Travel Trailer. 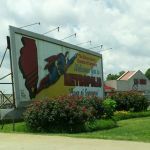 Drive into Metropolis and see the huge Superman statute (free) and visit the Superman museum ($5). The full service Big John's grocery store next to the park had everything we needed to restock. Campground was mowed and well kept. Site was well shaded. Didn't have to use our awning. Water heater at rest rooms was not working. We had a problem with our slideout and the host advised us of area businesses that were able to help. Camped here for the Superman celebration. Will stay here again. We camped at Fort Massac State Park in a Motorhome. Superman celebration held 2nd weekend in June. The sites were large and level gravel pads. The road within the park was blacktop and easy to maneuver. Back-in parking was easy and was large enough to hold our 39' motorhome and towed vehicle. Most sites appeared to be 30 amp service with just a few 50 amp at the same price. Verizon telephone reception was good. We stopped at the host's site and paid for our site. He told us to pick out any site that did not have a reserved sign (which was most of them). It had rained heavily recently so there were a few pools of water close to the pad but not on the pad. A nice surprise for us was a concrete bike path that started in the park and went for several miles on an old railroad bed. We stayed for 1 night and it worked well for that but I doubt if we would spend more than a couple of nights in the park if we were to pass through again. 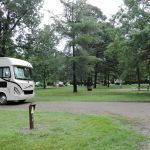 We camped at Fort Massac State Park in a Motorhome. This is a lovely park with lots of trees and grass. It is very spacious and quiet. Only hookup is electric. Water is available as is a dump station. We found a large site with 50 amps that was fairly level and had a southern sky exposure for our satellite antenna. Camp host friendly and helpful. Location along the Ohio is a plus. We enjoyed our stay here. We camped at Fort Massac State Park in a Motorhome. Restrooms currently have a new water heater, which they did not have 2 years ago. If you are going to use the showers, take a lawn chair with you to put your clothes on, as there are no benches or hooks in the shower area. Due to a flood at the campground, new power pedestals have been installed at some camp sites. The campground hosts are also new, very friendly and are out and about more often than the previous host. We were here for the Superman celebration in Metropolis and enjoyed our stay. No problems with the campground. We camped at Fort Massac State Park in a Motorhome. Are you affiliated with Fort Massac State Park ?